Jewish celebs having bar mitzvah celebrations seems to be a trend in Hollywood these days. Most recently, Drake celebrated a second bar mitzvah during the filming of a music video in Miami. Actor Kirk Douglas famously celebrated his second bar mitzvah in December 1999 at Sinai Temple in Los Angeles on the occasion of his 83rd birthday (it's a tradition to have a second bar mitzvah at 83). Of course there have also been famous fictional bar mitzvah celebrations like "Krusty the Klown's Wet 'n' Wild Bar Mitzvah" on "The Simpsons" and Ari Gold's daughter's bat mitzvah on "Entourage". 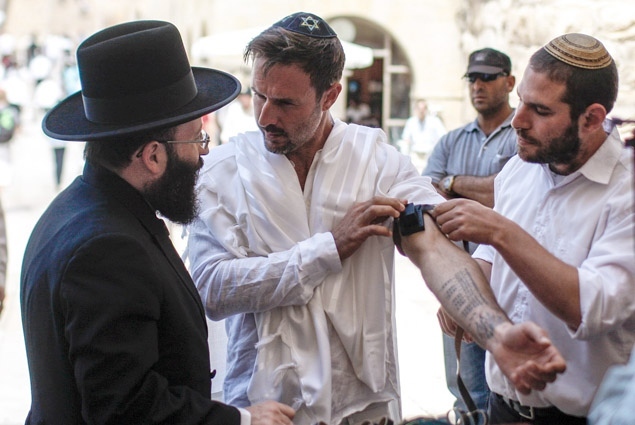 Today it was announced that actor David Arquette had a bar mitzvah at the Kotel (Western Wall) in Jerusalem. The last newsworthy bar mitzvah at the Kotel was in May 2010 when Chicago Mayor Rahm Emanuel (then Obama's Chief of Staff) brought his family to the Old City of Jerusalem to have his son's bar mitzvah. According to the Jewish Or Not blog, David Arquette is Jewish. His mother was born Jewish and is the daughter of a Polish Holocaust survivor. Arquette's father converted to Islam. Arquette has been married to actress Courtney Cox, who starred in "Friends" television sitcom and co-starred with Arquette in the "Scream" films. If anyone would like to plant a tree in honor of David Arquette's bar mitzvah, simply click this link.